....when it comes to Maxi Clutches. I know what you were thinking, dirty mares..
Another one of my all time favourite obsessions is maxi clutches. Well before the Chanel babies came into my life any night out I was on, you would see me with a clutch bag of various sizes. To me an ideal clutch is one which you can fit just the right amount of products in it- no-one wants to see outlines of whats in your bag bulging through. Also the use of a brightly coloured clutch can add a pop of colour to a plain outfit, or teamed with a brightly coloured dress your doing the colour blocking trend. For some reason I always want to use a brightly coloured maxi in the summer, however at this time of year you can hardly find any. I always find that its Christmas time when the stores decide to stock their nice clutches. However there are some gems to be found on the highstreet..
Top- Sloan Leather, £215 Michael Kors @ Net-a-Porter.com, Black Envelope, £45 Warehouse, Woven Leather and Suede, £395 Miu Miu @ Net-a-Porter.com, Pink Patent Leather, £12.99 New Look. Bottom- Blue Metal Tip, £18 Asos, Pink Twist Lock, £25 Topshop, Black Flat Zip Contrast Clutch, £20 Asos, Cream Weave Metal Tip, £30 Asos, Yellow Portfolio Envelope, £20 Asos. 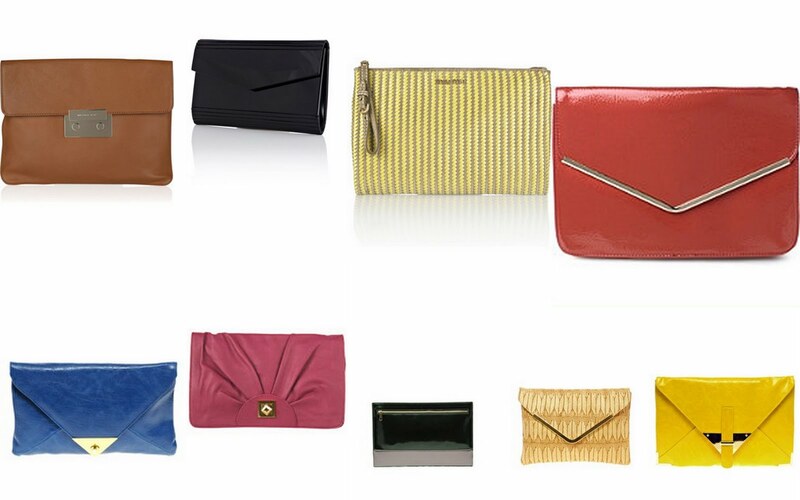 As you can gather, Asos have come up trumps with having the best selection on maxi clutches. I am loving the bright primary colours- definately debating whether to buy either the blue or the yellow clutch or perhaps the cream woven one for Holly's hen do. Or I might just buy them anyway, any excuse to spend money. For me the maxi clutch trend will never go out of fashion- whats your thoughts on it? ?